Amidst high expectations in 2011, football failed to live up to the billing that comes with the title of “UAA Champions.” Chicago struggled with consistency in their first few games before hitting their stride in October and ultimately falling victim to the intense physicality of the UAAs. 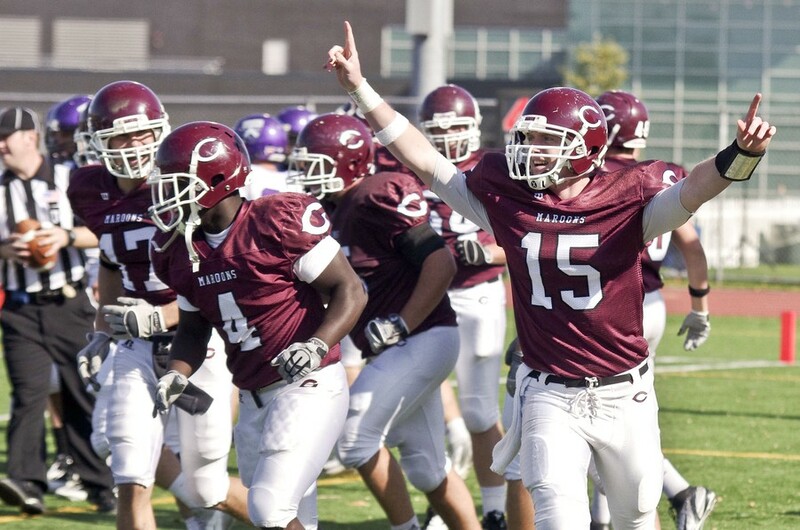 The Maroons began the year with a 44–25 victory over Beloit on the back of a strong running game, racking up over 250 yards and four touchdowns on the ground. Chicago dropped their next game to Concordia, before coming from behind to beat Elmhurst in the fourth quarter on a punt return by third-year receiver and return man Dee Brizzolara. Next up was Wabash, who pounded the Maroons at Stagg to the tune of a 49–7 beat-down, their first home loss since 2009. At 2–2, Chicago was left without much hope for a playoff bid. The Maroons responded in impressive fashion, however, reeling off three straight victories over Ohio Wesleyan, Denison, and Kenyon by a combined 50 points. But just as the Maroons looked to be turning their season around, they hit conference play. Chicago traveled to Case Western, where they lost a tense defensive struggle to the eventual conference champions and returned to Stagg clinging to slim title hopes. Even the annual homecoming game wasn’t enough to right the ship, since as Carnegie torched Chicago for 340 rushing yards and four touchdowns. To top it off, the Maroons lost the Founder’s Cup to Wash U for the 18th time in 25 years, allowing four passing touchdowns to the Bears. In all, football’s 2011 season was a disappointment, but only because of the lofty expectations set in preseason. The Maroons will return a myriad of starters next year, including several key playmakers on offense, in an attempt to return to the successful ways of last season. These days, it is difficult to talk about Chicago football without mentioning third-year receiver Dee Brizzolara. Since coming to the U of C, Brizzolara has been one of the best receivers in D-III and has set a plethora of records for the Maroons, including modern school records for receiving yards, receiving touchdowns, total touchdowns, total points, and all-purpose yards this season. Brizzolara made contributions on special teams, as well, having scored twice on punt returns during the season. The standout receiver led the UAA in all-purpose yards, receiving yards per game, and total touchdowns and was rewarded with the UAA offensive MVP award for the second year in a row. First-year running back Zak Ross-Nash entered the season behind second-year Ian Gaines and fourth-year Francis Adarkwa on the depth chart, but vaulted his way to the team’s primary running back spot by the end of the season. Ross-Nash emerged in Chicago’s victory over Ohio Wesleyan with 89 yards on 18 carries and never looked back. Over the course of the season, Ross-Nash accumulated 473 rushing yards on 95 carries and averaged 5.0 yards per carry for a Chicago team that otherwise struggled to successfully run the ball. In games in which he had at least 13 carries, Ross-Nash averaged 88.4 yards, a figure that would have ranked second in the UAA over a full season. Second-year tight end Tom Bemenderfer established himself as a reliable target for Chicago quarterbacks this season after failing to record a reception. Bemenderfer hauled in 14 passes for 166 yards over the course of the season and tied for third on the team in receiving yards with third-year and fellow tight end Brandon Meckelberg. Bemenderfer averaged 11.9 yards per catch on the year and caught three balls for 41 yards in the Founder’s Cup against Wash U in what could be a preview for things to come. He also received an honorable mention for All-UAA honors.